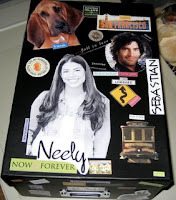 Those of you who were here a month or so ago may remember my "box" out of which I've been writing Sebastian and Neely. I've been adding to it as I've done research. It now has pix of a great place in the Napa Valley to have a wedding (not theirs!) and an interview with a local resident who lives where I want them to live. It has more notes from my architect friend. It has several maps and reminiscences of early trips to San Francisco that I took when I was in college. That's the thing about writing. Nothing is ever wasted. My other box is my brain -- all the memories and emotions and ideas that have been bouncing around in there for longer than I like to think. All of it is grist for the mill. But now I have a new place to put it -- my external box. And I like it because I don't think, "Hey, that's a great idea," and then promptly forget it again. I toss it in the box and periodically I go through the box and discover things I've forgotten that really are surprisingly good ideas and actually help fill in empty spots in the plot. The plot itself is coming together, but the focus is shifting a bit. It's the "Presents" influence, I suppose. It's the same story with a different emphasis. I'm not sure about it yet. We'll have to see how it goes. It's taking more time, though, I know that. When one of my boys was little he had a lazy eye and they patched the good one so he'd look out of the other one and strengthen it. Frankly that's what it feels like I'm doing in this book. My natural inclination is to do it one way -- which is not precisely "the Presents way" though I would say it's "the McAllister way." I don't yet know how I feel about doing it with this different focus. We shall see. I'm willing to give it a shot because it's a challenge as a writer. Will it be as good a book? I dearly hope so. Keep your fingers crossed. I can't -- I'm holding the baby. And trying to write the book. I am pleased the box is working for you. Interesting I was going through Grose's dictionary of the Vulgar Tongue -- it was the thing that defined cant or slang in the regency. The term *knowledge box* refered to one's head. It is good to hold babies because babies have a tendency to grow. Thanks for the definition, Michelle. Glad to know my "knowledge box" has a regency predecessor! And Mads, I'm sure you're right, but at this time in a book there is always the "shall I go this way or that way?" feeling. Not helped, I might add, by "feeling" that McAllister would do it one way and "the Presents line" would do it another. Pretty much, though, I have to do it the way the book needs it done. I've written 59 books by giving my allegiance to the characters and their story. I suspect I'll have to do it again here, no matter what.